Oh...my...word... I have been SO busy I have not visited blogland for days!!! Please tell me everyone else has been swamped and I didn't miss too much?! Between working super-hard on training my sweeties on how 1st graders are SUPPOSED to act, Back-to-School night, attending my middle school son's BTSN, keeping up with custom blog design orders, and everything else family life throws at me...how's a girl to find her blogging time?? For now, the answer is stay up past her bedtime to share one thing we did this week. My students (like all of yours I'm sure) LOVE Pete the Cat! I think the MP3 of the author reading/singing it is awesome if you haven't tried that. TOTALLY adds to the experience! I have not bought the new book yet but I will when I get two seconds! I decided it would be fun to write our own class book based on this story. To make it quick and easy I just used a clear view binder. I was so busy I didn't even add a cute border...egads...that is just plain wrong!! I uploaded a version without my name on it here if you'd like it. 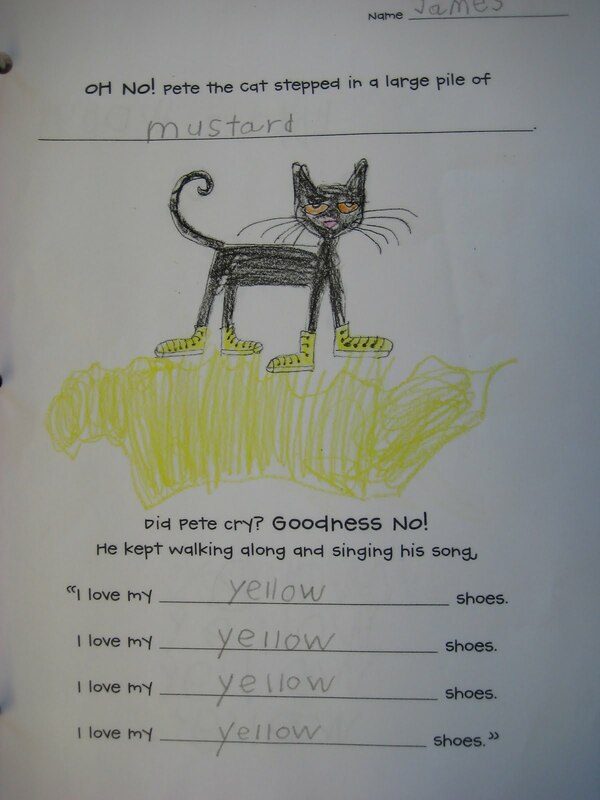 First, we brainstormed a list of new things Pete could step in and the color his shoes would turn. Then, I gave each student this sheet with a picture of Pete already drawn (by me, it is Pete-ISH as we say in my room) and asked them to draw the large pile of bananas (or whatever) he was stepping in. Finally, they filled in the sentence frame with their food and color. They could copy the spelling off our chart or try to write the sounds they heard like we have been practicing in writer's workshop. The most original idea: Tofu! If you'd like a copy of this page click here. I did another activity with Pete the Cat but you'll have to wait to read about it because this teacher tends to get a tad GRUMPY when she is sleep deprived. Definitely agree with you that I just can't seem to find the time lately. I always forget how busy the beginning of the school year is and how gosh darn tired I am! I love making class books, especially at the beginning of the year. This Pete the Cat book is wonderful. Thank you for sharing. Thanks for staying up late to do this! ♥ it! I love this! Thank you! Don't feel bad...I had about a gazillion unread posts on my Google Reader when I turned on my computer this afternoon. Jen, you are not alone in feeling exhausted! 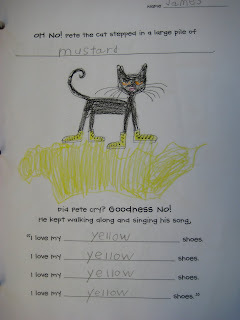 So thank you for sharing the PETE the cat writing papers. I hope your class could enjoy PETE the Cat on youtube. The orginal book is better quality for the storytelling. My class enjoyed the newbook on youtube, too. Thanks again! Thanks Jenn! I was going to make up something similar and now I don't have to! From one exhausted teacher to another - you just made my day! When your kids give a good attempt to write the words (but are spelled incorrectly), do you leave them that way for publishing...or do you translate their dictation off to the side? Right now I leave their misspellings. I make a big deal about how important it is to put down the sounds you hear and not stop writing to worry about the spelling. Now, at the end of our first writer's workshop unit we are going to pick one piece to publish and I am going to start teaching them about revising and editing. I will occasionally write a word in cursive off to the side if I think that neither of us may know what it was supposed to say later. Hope that helps! I love this!!! Thanks for sharing...I'm going to try this one out tomorrow! I am sleep deprived right now and am LOVING your page. Exactly what I was looking for...and hoping I wouldn't have to make myself. ;) Thanks friend!